Here is part six of my non-fiction work about the National Radio Astronomy Observatory in Green Bank, West Virginia. You can also read parts one, two, three, four, five and seven. The NRAO site is around 2,700 acres. It runs along the crest of the adjoining mountains. One big current problem, that will only get bigger in time, are wireless routers folks are starting to use in their homes. Mr. Sizemore has actually gone out and identified every wireless router in the area. At the time of writing there were 45 such routers. The NRQZ (National Radio Quiet Zone) gives the NRAO the right to file comments to the federal frequency regulation bodies (FCC and NTIA) for permanent, fixed, licensed radio transmitters wishing to be installed in the NRQZ. The NRAO does not have any “power” to regulate radio use. However, the FCC and NTIA “determine”, in most cases, that it is in the public interest to uphold the NRQZ protection requests. However, there is a West Virginia state law that provides protection within a 10 mile radius of a radio telescope from any source, licensed or unlicensed, that causes interference. A wireless router, like a garage door opener, is an unlicensed device and thus falls under the state law. Still, each case of interference has to be treated individually, and it is in everyone’s interest that it’s resolved it in a friendly way, for the sake of community relations. At the time of writing, Mr. Sizemore was working with the NRAO lawyers and local legislators to see how the problem of wireless routers could be addressed. They’re a real problem when it comes to interference, and they’re unlike past problems, where faulty equipment was to blame, which could be fixed or replaced. Well-functioning routers will emit interference and cause significant problems to NRAO’s daily work. Of the 45 routers mentioned above, 26 were provided by the local telecommunications company to their customers free of charge, with the contract, so they could be removed by the telecommunications company itself. The rest were privately owned, and NRAO was naturally pursuing a voluntary removal approach with the router owners. In the office space above the control rooms are the offices of the scientists and staff at NRAO. It’s a long hallway, part of the new construction, cleanly carpeted. The walls are filled with research posters. Mr. Sizemore and I stopped to talk about one of the posters. Before, folks thought of the galaxy as a fairly uniform soup of fog. With the GBT (Green Bank Telescope), Jay Lockman, one of the senior scientists at NRAO, was able to discern that this fog was more like clouds. To the layperson, this may not seem like a lot, but to astronomy, that’s a big piece of the puzzle. Now they can try to figure out how the clouds work, what they’re made of, how they move, etc. This discovery could not have been made until the GBT was online. As we continue to walk, one side of the hallway draws particular attention. Framed photos of the various Jansky lecturers are mounted there. Every year one is chosen, and he gives a lecture on a subject of his choosing. A lot of them are Nobel prize winners. Grobe Rieber was one, of course. Frank Drake (the Drake equation) is also one. Arno Penzius and Bob Wilson are also on the wall. They are Nobel Prize winners for their early work on background microwave radiation. They are the two scientists that discovered background radiation. There’s an interesting story behind their work. In October of 2005, Mr. Sizemore met the technician who did the hands-on work for their experiments. The man and his wife visited NRAO one day, and Mr. Sizemore showed them around. The man acknowledged that he was scared for his life at times, as he worked with them. They had no sense of the practical or common sense, and would often ask him to do very dangerous experiments. Penzius, for example, could not figure out how to unbuckle his seatbelt. The technician had to do that for him. He couldn’t figure out how it worked, and yet he won a Nobel prize for theoretical work in physics! Mr. Sizemore showed me his old office, the Quiet Zone office. That’s where the administrative work for the NRQZ is done. He used to be responsible for that, but he’s thankfully gotten help in that area in late 2005, when NRAO hired an NRQZ Administrator and let him focus more on chasing down interference. While he was in that office, he conducted more than 10,000 propagation studies. Paulette Woody, the new NRQZ Administrator, started on the 17th of October, 2005. As we drove on the NRAO campus, Wesley stopped to show me his “hiding place” – his monitoring station, where he does his RFI hunt-work. It’s a big trailer that can be hauled from place to place, but has been made stationary and hooked up to power lines. Here he monitors the gross violations of the Quiet Zone and also looks at the local environment – powerline noise, illegal use of radios, etc. For example, at the time of my visit there, the amateur radio bands were being used improperly by a group of people and the signal was strong enough to overload the 140-foot telescope, so it became a serious problem. Wesley told me that it will likely be taken care of long before I write up about it, and the likely action taken will be that he calls the FCC in, to enforce the rules in place. After 20 years on the job, Wesley has built up a network of contacts he can call upon when he needs help. One of those contacts is the man in charge of the Enforcement Bureau at the FCC, whom Wesley knew when he was still a satellite technician. Depending on the sorts of studies performed, the data collected by NRAO in a single day can get to be as much as 50 GB (nowadays it’s probably more than that). The data is usually written to LaCie portable drives and either handed out or shipped out to scientists responsible for the studies. The data isn’t archived locally. It’s recorded for the individual astronomers. Once it’s shipped out, it’s someone else’s data and they are responsible for it. If they lose the drive containing the data, they need to re-run the study. NRAO simply doesn’t have the money or the staff to act as a data warehouse for the data. Astronomers, like most scientists, also guard their data quite jealously and consider it proprietary until they decide whether they can publish it. The sewer system on site is unique. Because NRAO has to worry about interference, they didn’t want any pumps on-site. What happens is that waste fluids from the sewer system flow into a series of sediment ponds that are built on a gentle slope. They are gravity-fed and include absolutely no motors. NRAO actually won an award for this design. As the water flows through the ground from pond to pond and through vegetation, it gets purified and is ready to be discharged into the adjoining streams of water. Mr. Sizemore had a story to tell about the motors that run the individual plates of the GBT. NRAO ordered a few samples, saw they worked alright, then ordered a whole batch, about 1,500 or so. When they started to do live testing, the motors ran out after a few days. They opened one up to see why and discovered that the carbon brushes were completely burned out. They’d disintegrated. Upon contacting the manufacturer, they found out that he’d switched the type of carbon brush from the harder ones they specified to softer brushes, which were a few cents cheaper per brush. They were basically cheating NRAO. NRAO’s Business Office sent back all the motors and had the brushes replaced. Add to this experience countless similar others over the years and one can see why they’re wary when dealing with contractors and manufacturers. There are other radio telescopes on the NRAO Campus, all of which are involved in ongoing research. 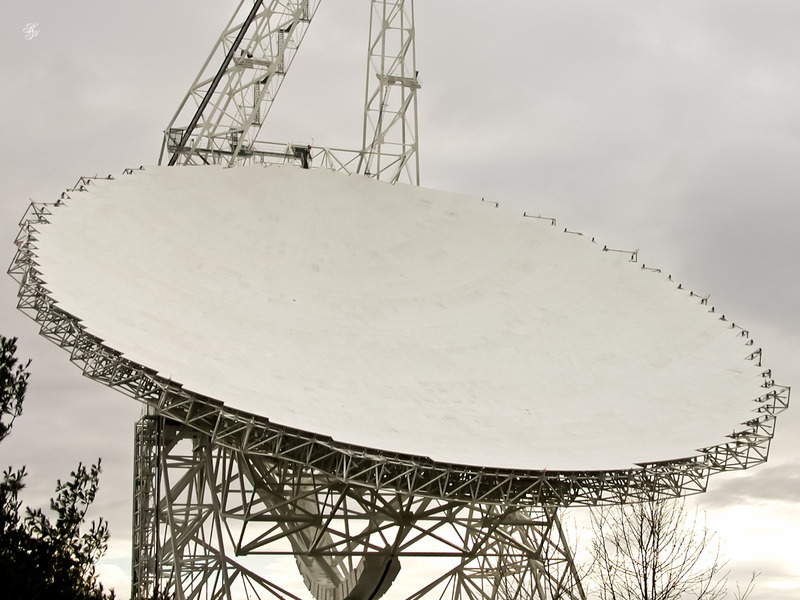 For example, the 45-foot dish is doing a project on solar radio burst spectrometry. They’re looking at the Sun and measuring the bursts of radio noise from it (solar flares and the like). They also have calibrators, which are rock-solid sources of radio waves. They always emit at the same frequency and strength. Researchers point their equipment at them to see if their equipment is reading correctly and make any needed adjustments. One of the telescopes on site is used as a teaching instrument. NRAO being involved in both research and educational efforts, brings groups of school-age children on-site to teach them about radio astronomy. The telescope is not a fancy, cryogenically cooled machine, but a simple wire-mesh dish with simple control and monitoring gear that the kids can play with. It’s fully functional though and it does pick up many radio waves. It’s sufficient to teach radio astronomy and galactic coordinate systems and such. The fastest telescope at NRAO is a 20-meter dish which will go from horizon to horizon in 90 seconds. It’s not being used at the moment. In the past, the most popular program at NRAO was universal time and polar motion. Time is not a naturally occurring thing. It’s a man-made contrivance. Time is nothing more than your position relative to something else at a given instance. We keep time by the rotation of the earth on its axis, and the rotation around the sun. Einstein said time is all relative depending on your motion and such. In order to keep accurate time, not only do we have to know the rotation of the Earth on its axis and around the Sun, but we have to know the wobble. Because the Earth is a spinning body, just like a spinning top, it tends to wobble. There’s a plaque next to the telescope, with a plot of the position of the North pole of the Earth over 5 years. You’ll see that it wonders around, it doesn’t stay in one place. In order to have accurate time, we must know what that wobble is. How do you do that? 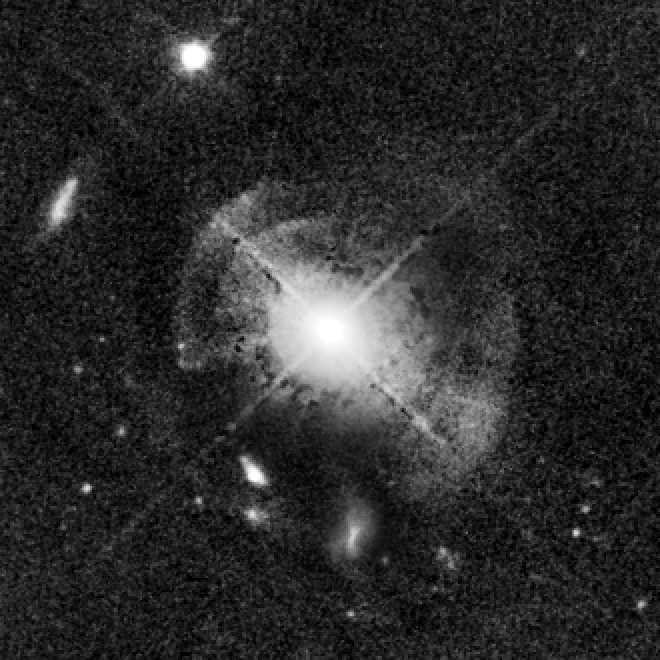 There are quasars. They are quasi-stellar objects. We think they’re the black holes at the centers of galaxies. They’re very far out there, and they’re very strong, so they can act as a point source. Even though the distance to them is enormous and they’re moving relative to us, because of that distance to them, their movement is insignificant compared to the movement of the Earth itself. When we look at those quasars and we see any apparent shift in their position, we can determine what the Earth’s wobble is. That’s a use of radioastronomy that most people can grasp: timekeeping. NRAO used to conduct regular time studies. Wesley actually started out at NRAO as an interferometer operator. The program running on the interferometer at that time was the universal time and polar motion. They fed that data into the master clock of the Naval Observatory. If you’ll remember, at the end of 2005, there was some discussion in the news because a leap second would need to be added to clocks. Wesley would take out leap seconds from atomic clocks. It would be done over time, with microsecond increments. NRAO was a major contributor to time-keeping for the US. We can use those same quasars to monitor tectonic plate movement, geodesic work. This is also documented on a plaque there. There are several major tectonic plates on the Earth’s crust. If you put a radiotelescope on one plate and one on another plate, then look at a quasar, any apparent shift in their position will be due to the movement of the crustal plates. That means we can use radio astronomy for geodesic-type work. The Howard E. Tatel Telescope was also the first telescope involved in the search for extra-terrestrial intelligence. Dr. Frank Drake, working on Project Osma, used it for his studies. That sort of work isn’t done by NRAO anymore. It’s not part of their primary mission. Now this sort of work is done through private organizations like the SETI (Search for Extra-Terrestrial Intelligence) Institute in California. You, dear readers, can participate in the study if you want, by downloading an application that will let your computer crunch through the data gathered from space in the search for signs of ET intelligence. The processing power of your computer will only be harnessed when your screensaver is active. This is a good example of distributive computing, where the power of many varied computers is put to work on a single task. The HET Telescope is not being used currently. It’s part of a three-element interferometer. The second element is another 85-foot dish on the NRAO site, and that’s now used to do pulsar studies. What are pulsar studies? Well, it starts with the sun, which is supposedly a fairly old star. It is hypothesized that in a number of significant years in the future (we’re talking billions), the physical nature, the make-up of the sun will start to change. It will collapse and throw off its outer shell, being left with a big hot center called a white dwarf. Now, if you have a star that is several times larger than the sun, like 6-8 times, when it’s in its death throes and its gravitation collapses, it blows off the outer shell, the nucleus will collapse to a very dense neutron star. A typical neutron star is several miles in diameter. If we were to compare what’s going to happen to the Sun in Earth-terms, It’s like collapsing our planet to the size of a golf ball. A teaspoon of that sort of matter will weigh hundreds of thousands of tons. It would have an enormous magnetic field, so the only radiation that will escape from that neutron star will be through the poles of the magnetic field. Since the rotational axis and the magnetic poles do not have to align, the star could be spinning on its axis and the magnetic fields could be perpendicular to that axis, so that it will act as a sort of magnetic lighthouse. 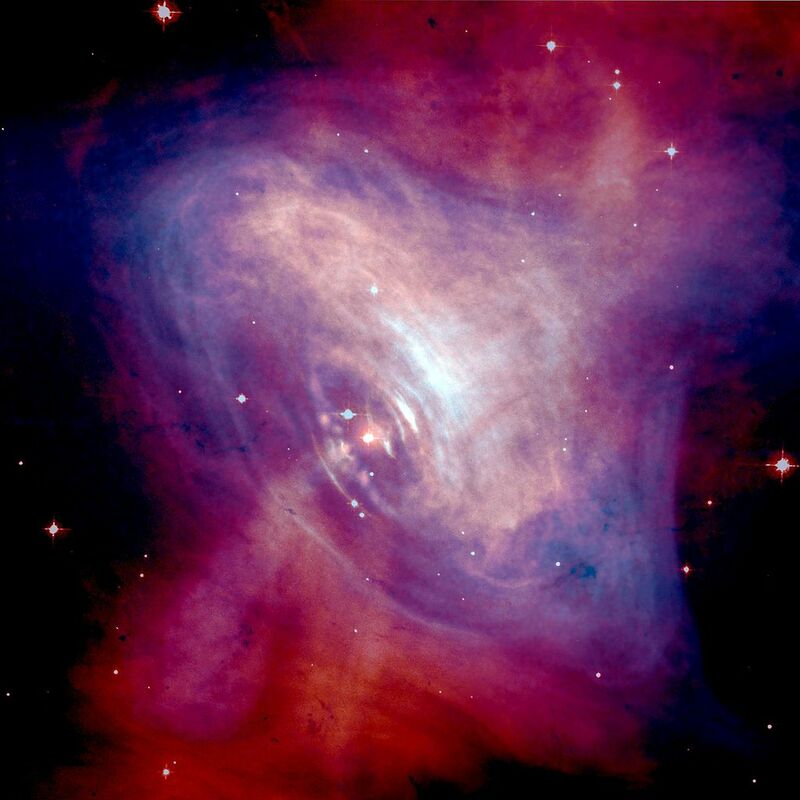 Every time it will sweeps its magnetic pole in the direction of the Earth, we will get a pulse of energy, hence the word pulsar. Why are pulsars interesting? Because the spin of certain pulsars is as accurate as we can time it with an atomic clock. What’s a second? 1/60th of a minute? No! It’s over 9 billion vibrations of a Cesium electron at a certain pressure and temperature. That’s the official definition. The pulsars that NRAO looks at spin at millisecond time intervals. A big research topic now is using the timing of pulsars to prove gravitational waves. There are certain time standards kept in cities throughout the world, such as Paris, Moscow, DC, but they are susceptible to destruction from natural or terrorist events. With pulsars, we have out of this world time standards that cannot be destroyed. They also serve as perfect navigational beacons, if we will ever do space travel. The question that’s been asked in the past is, why don’t pulsars slow down? Well, they exist in binary pairs, two of them orbiting each other. Our Sun is an oddity, because it’s alone out there. There can also be trinary star systems, but gravity usually kicks the third star out. You know what they say, three’s a crowd… So, these pulsars are in binary orbit with other stars like red giants, white dwarfs, or other some such thing. They feed off the energy of their companion, and they don’t slow down, they stay in a constant rotation, or at least as constant as we can time it. There are platforms out in the field at NRAO. They’re actually crossed dipoles. One of the big questions in astronomy is reionization. The dominant theory of the creation of the universe is the Big Bang. When it occurred, that primordial soup was extremely hot, so everything was fragmented into elemental particles, such as quarks, muons, etc. As things cooled down, particles came together and created molecules, then stars, etc. When the stars started to fire up and generate ultraviolet light, they re-fragmented some of the elemental hydrogen left over from the big bang that had not yet coalesced. That hydrogen was re-fragmented to its elemental particles, and sometime later, it re-congealed. NRAO is looking at that reionization process. They’re looking at this cycle of heating and cooling that takes places as the universe expands. Don Backer, one of the astronomers at NRAO, is looking at that extremely red-shifted signal (meaning very big waves) to see if he can determine when the heating/cooling cycles occurred. The signal is somewhere between 125-226 MHz. They’re not sure where that signal is and what frequency they’ll find it at, so they’re hunting background radiation at the moment, trying to discern a “flashlight in a floodlight”. When they do find it, it’ll be interesting. One of the things you’ll notice at NRAO is that there are no powerlines on-site. All of the power cables are underground. There’s a main cable that feeds the site, which NRAO runs through a generator where the power is conditioned, mostly in its frequency. The cables that run to each building are all buried. It’s easy to understand why. They don’t want any arcing of power lines above ground. A couple of years back, one of their lines went dead and they started digging around, looking for the cause. It turned out to be a black snake which had crawled across two contact points and shorted itself and the lines. He was still there, unable to move, because he’d been fried! And that’s the end of part six. You can also read parts one, two, three, four, five and seven.